This pioneering encyclopedia illuminates a topic at the forefront of global ecologybiological invasions, or organisms that come to live in the wrong place. 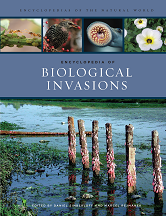 Written by leading scientists from around the world, Encyclopedia of Biological Invasions addresses all aspects of this subject at a global levelincluding invasions by animals, plants, fungi, and bacteriain succinct, alphabetically arranged articles. Scientifically uncompromising, yet clearly written and free of jargon, the volume encompasses fields of study including biology, demography, geography, ecology, evolution, sociology, and natural history.